On October 1, 1982, Walt Disney World’s Epcot Center opened with five Future World pavilions and nine World Showcase Pavilions — Mexico, China, Germany, Italy, American Adventure, Japan, France, United Kingdom, & Canada. Opening on September 7, 1984, Morocco was part of the first expansion pavilion to be added to World Showcase. Located along the World Showcase Lagoon, the Epcot Morocco Pavilion is full of authentic merchandise, food, and music. Take this fun quiz and test your knowledge of Epcot’s Morocco Pavilion! The Morocco Pavilion, at Epcot is located between the Japan and what other pavilion? What is the name of the shop in the Morocco Pavilion that sells fun souvenirs found in Morocco such as a clothing and shoes, mirrors made from camel bones, and daggers? What is the name of the elegant waterfront signature sit down table service restaurant in the Morocco Pavilion that focuses on a menu of Mediterranean small plates? What is the name of the walk up quick service restaurant in the Morocco Pavilion where you can find wonderful Mediterranean specialties, salads, and desserts? Which Walt Disney character would you find having a meet and greet in the Morocco Pavilion? Which is a popular alcoholic beverage in the Morocco Pavilion? What is the name of the sit down table service restaurant in the Morocco Pavilion that features belly dancers in the sultan’s palace? Which delicious food item would you find on the Spice Road Table menu in the Morocco Pavilion? What is the name of popular Rock and Roll band set to Arabian rhythms that played in the Epcot Morocco Pavilion from April 1999 – September 2015? 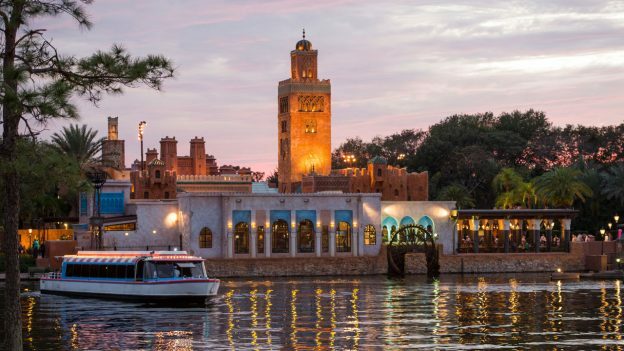 What is the name of the Moroccan prayer tower in the Morocco Pavilion, which can be seen from across the Epcot World Showcase lagoon? As someone who spends very little time in this pavilion (I can’t handle the smells), I’m surprised at my score!!!! Booyah! My favorite pavilion! I hope to see the real Morocco someday! I didn’t do so hot. But I, too, don’t spend a ton of time at the Morocco pavilion. even though it is one of the most beautiful.